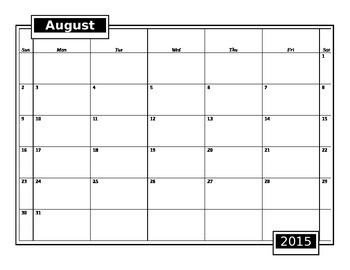 Here is a simple, blank, and completely editable 2015-2016 school calendar. It is in word document format and the squares for the week have been enlarged while the weekend is smaller. Use it to type your pacing guide or even abbreviated lesson plans for the year. Keep up with it from year to year and have your lesson plans for the year ready to go at the beginning of school! I have been using this format for years and it really works for me.